Skimmed milk ** (Germany), whey powder * partially demineralized, vegetable oils * (palm oil *, rapeseed oil *, sunflower oil *), maltodextrin *, calcium carbonate, potassium chloride, sodium chloride, vitamin C, vitamin E, iron lactate, zinc sulfate, niacin, calcium D Pantothenate, copper sulfate, vitamin A, vitamin B1, vitamin B6, manganese sulfate, potassium iodate, folic acid, vitamin K, sodium selenate, vitamin D.
We love this formula. I had been looking for an organic formula with no corn syrup and this product has been perfect. My little one takes it great and it has been super easy to purchase through Little World Organics! 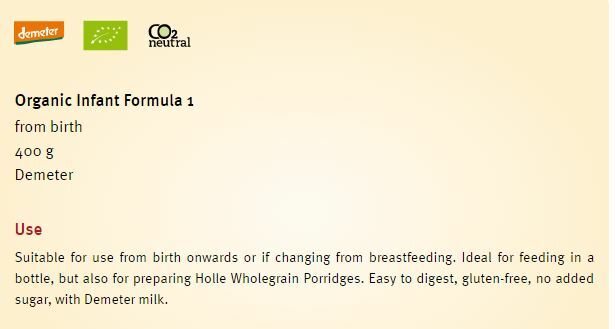 I love this formula, I breastfeed my babies as long as possible, but eventually need to start formula. Holle mixes well, and my babies rarely ever spit up or have tummy troubles with it. I’m glad I can give them something natural and healthy. Got my order quickly and with no damage. I had a question about formula preparation and the shop owner emailed me back immediately. The formula is great and mixes a lot smoother than the stateside formulas we’ve tried.